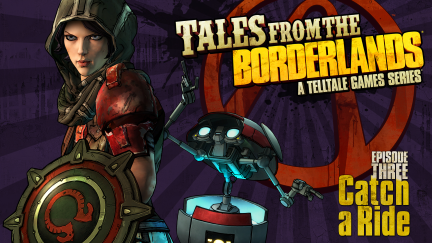 The third episode of Tales from the Borderlands keeps the ball running, with a fantastic chapter that keeps the momentum set by the excellent chapters that came before it. The episode begins as the duo find themselves in danger. There are more people who want the full power of the Gortys project, and Rhys and Fiona are their way to get what they want. The series begins to take an interesting turn depending on your choice of who to side with, and the designers have fun with that choice. The bionic eye of Rhys has always been a nice addition to the game, being both useful to game play, as well as bringing back the look function in a new way. It's even more fun now. If you choose to side with Jack, the optic output of the eye implant of Rhys displays sarcastic information about an object you scanned instead of the regular information feed from Hyperion. The voice cast once again shines, but the breakout of this episode is the voice actress of Gortys. Her character is written with a simple, cute charm, and her voice is a big part of that. Her interactions with Loaderbot are the highlight of this chapter. The music once again continues to shine right alongside the excellent voice work, especially the title song. The opening sequences in this series have been a delight since the beginning, and that trend continues in full force here. The third chapter of Tales from the Borderlands feels a bit short. It more than makes up for it with an excellent narrative with branches from choices that are beginning to have a noticeable effect on the story line, Both new and returning characters are excellently voiced, their interactions are memorable, and the music frames the story and blends in with the excellent voice work seamlessly. If the story continues on this path, Rhys and Fiona are truly destined for greatness.